Avelignese are heavy horses found throughout Italy. They are beautiful and hardy enough to handle most any challenge. 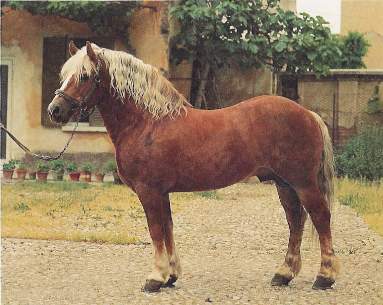 Avelignese horses are one of the few breeds referred to as surefooted styles. These surefooted horses can endure traveling through the desert and in extreme temperatures without any issues. They can be utilized for equestrian vaulting and also for therapeutic riding purposes as well. They have been bred with a unique format so that you know which horse came from where. For example, if the horse is from Austria, they will bode a brand that is just the letter “H”, whereas the ones from Italy will bode an “HI”. Avelignese horses are calm enough to be utilized as a riding horse for children. They are rather gentle and kind animals. They are unflappable, strong, durable, and placid. Avelignese horses stand around fourteen hands in adult full grown size. They have small heads, are muscular, and strong. They are excellent quarters, and are built for strength, strong feet, a thick neck, and a spacious chest for their hearts. They are commonly noted for their beauty. They have a long tail and usually a wavy mane that makes them easily recognizable. Avelignese horses are graded by certain requirements such as temperament, color, bone, and action. Upkeep of an Avelignese horse is rather basic. They do not require special care at any level, they are generally easy going, and they can be simple to care for.